Ages ago, oh, well only 7 years I'd say, I recall discussing the idea of a grand book on Scottish mountain crags with Guy Robertson and Adrian Crofton, a kind of regional upgrade and remix of Extreme Rock/Cold Climbs. They wanted to create something grand and poetical, giving the landscape as much presence as the climbing, and mixing the best writing with the best photography. 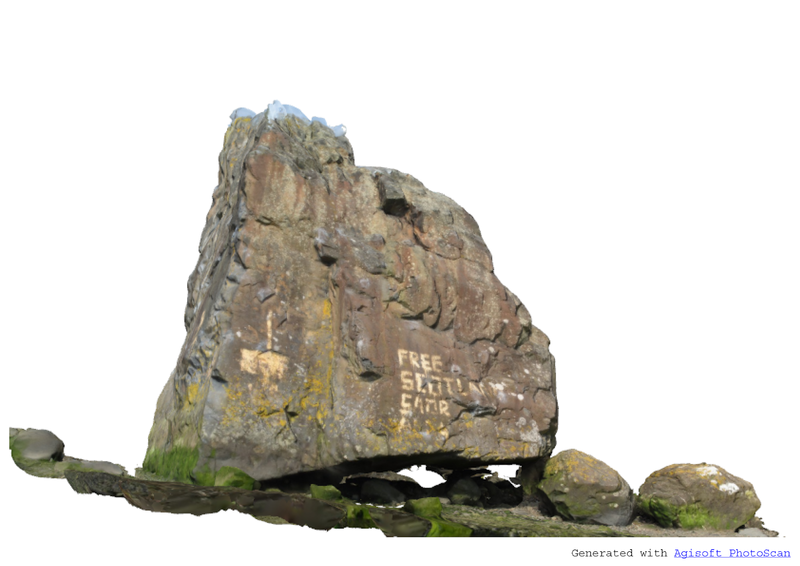 It was a 'Big Stone Country' project and one too big for a small independent publisher. It gradually grew into a concept requiring significant resource and commitment, possibly even beyond Trustee based publishing such as the SMC. The history of publishing Scotland's climbing has now over a century of documentation. The first SMC journal was in 1890 (the journal including a chapter on Arran bouldering in 1897!) and it has kept a diligent and accurate record ever since, as well as including fine articles and writing over the decades. W.P. Haskett Smith produced volumes of guides in the 1890s to England, Wales and Ireland, but neglected Scotland. A. Abraham produced a Climbing in Skye guide in 1908 (and G. Abraham produced British Mountain Climbs in 1909, at a time when regional nationalisms had yet to fracture Britain's unity and consolidate boundaries again). The Scottish 'master' Harold Raeburn published books, such as Mountaineering Art (T. Fisher and Unwin, 1920), but this was for an Alpine age and Scotland, let alone Britain, was still considered a practice ground, or drilling square, for technique which was to be taken to the Alps and higher ranges of the Himalayas. A compiled narrative of the Scottish experience of climbing wasn't produced until the resilient W.H. Murray rewrote from memory (after his first prisoner-of-war draft had been destroyed) the now classic and poetic Mountaineering in Scotland (J.M. Dent,1947). This captured the wealth of philosophies, geologies and moods to be found in the Scottish mountains whilst climbing, from the Cuillin's sticky gabbro flanks to the lonely step-cutting epics on the Ben in winter. W. A Poucher brought out his classic hill guide to Scotland - The Scottish Peaks - in 1965 with some very suggestive photos for climbers (such as the overhanging beak of the Cobbler's north peak), but again the black and white photography seems gloomy to a modern eye, though perhaps originally it captured the imagination of black shadow and silvered, watery light that Scotland does so well. It was Hamish MacInnes' 1971 twin volume guide Scottish Climbs: A Mountaineer's Pictorial Guide To Climbing In Scotland (republished in one volume by Constable, 1981) which was the first 'complete' compilation of Scottish mountain rock and winter routes, though its pictorial claim was dulled somewhat by poor paper stock flattening a lot of excellent (and now historical) climbing shots. Its photo-topos of the great shadowy monoliths in the hidden corries still managed to spell out a hefty dose of adventure and character. Then came the legendary Ken Wilson 'quadrilogy' - Hard Rock 1974; Classic Rock, 1978; Cold Climbs, 1983; Extreme Rock, 1987 - which published in large format and in colour, mixing narrative with topos and photography. Despite Scotland getting a more-than-fair share of crags and dwarfing some English craglets (quite naturally due to its topology), the books rapidly became the go-to reference for keen British craggers out to 'tick the lot'. Not many did, as 'The Scoop' (Sron Ulladale) saw to almost everyone in the Hard Rock challenge! These books in the 70s and 80s have now thankfully been reprinted, though the plates were lost for Extreme Rock and its rare editions now fetch hefty prices on the second-hand market. The laudable SMC/SMT area guides (and 'The Journal') continued documenting Scottish climbing and the endlessly re-editioning and morphing ticklist of The Munros (first edition 1985) gave an approach-led introduction to discovering new crags, often mentioned in passing as the walker was led to the summit tick. For climbers, the mountain area guides provided the best narrative introductions to the climbing conditions and main routes on the mountain crags: North-West Highlands, Islands of Scotland Including Skye, Southern Highlands, Southern Uplands, Central Highlands, The Cairngorms, Ben Nevis - Britain's Highest Mountain (2009), whilst the pocket climbing guides to each area are renowned for their detail and accuracy and are in every climber's nearest access pocket. Yet still a comprehensive tribute to Scottish mountaineering and cragging was missing. In the 'modern' era of decades since the 70s, ever since cams, sky-hooks and RPs, and since modern precision-designed rock shoes, new rock routes proliferated and grades jumped to E5 and above, now up to the famous E11s by Dave MacLeod. Technology, especially in winter kit (drop-head axes; front-point crampons; thinner, longer ropes; thinner clothing and gloves), allowed a surgical rather than bludgeoned approach to the rimed cliffs, and consequently the 'mixed' tradition in winter has upped the scale of technique and boldness above grade IX. Excellent modern guide compilations include Kevin Howett's self-illustrated (these crag drawings are now classics) Rock Climbing in Scotland (1st ed. Constable, 1990), though again the imagery was black and white and the text had to be limited to pitch descriptions rather than expansive narrative. Even at 480 pages, this was subtitled 'a selected guide', but it was the only guide that had all the classic extremes (not to mention the famous midge-rating system!). The proliferation and popularity of climbing set in train a number of new guide-books to Scotland in the 2000s, such as the excellent SMC guides, including the full-colour selected guide: Scottish Rock Climbs, (ed. Nisbet, 2005) and Scottish Winter Climbs (2nd ed. 2008, ed. Anderson, Nisbet & Richardson). Gary Latter's Scottish Rock in 2 volumes (Pesda Press, 2008), focused on colourful photo-topos (and remarkably Mediterranean weather!) but they of course, as guidebooks, could not make room for too much narrative. 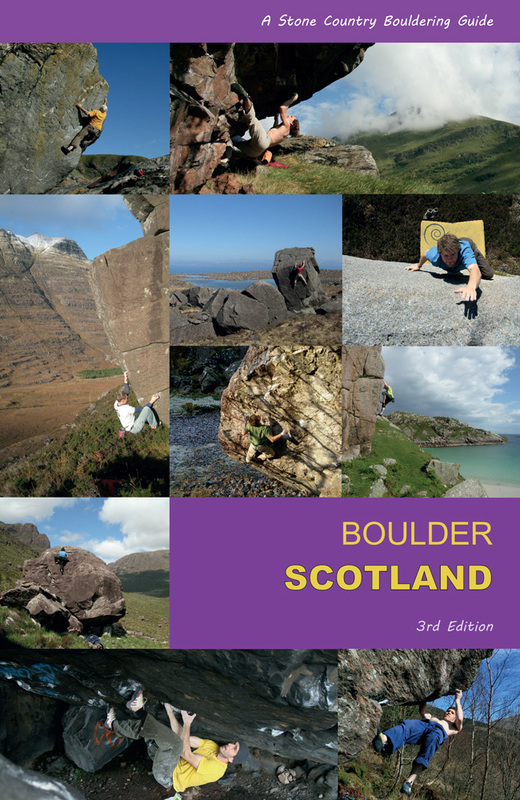 Even bouldering had a look-in as a 'mountain activity', with the first Stone Country Guide to Bouldering in Scotland publishing in 2005, focusing on the stony landscape, narrative and photography of Scotland. Still, no-one had ever really thought to collate the massive geologies of Scotland into one giant book of photography and narrative. The guidebooks were there, but the coffee table was empty of tribute. Thankfully Vertebrate Publishing has fixed this and we have, like a thunderous alpenhorn of calling: The Great Mountain Crags of Scotland (Vertebrate, 2014). Vertebrate Publishing has stepped into Scotland with a genuine enthusiasm for the unique character of climbing here. It has brought a coffee-table commitment to the format of the book, which is laudable in a digital age when publishers are reining back from costs and large format printing. For those long years, Guy Robertson and Adrian Crofton kept gathering and editing (and climbing! ), as well as cajoling reticent writers and talented photographers to buy in, at their own cost, to the project. The result is a collection of everything dear to the Scottish climber (or 'climber in Scotland', whatever you prefer, though climbing here does tend to make you a 'Scottish' climber if you stay long enough). The book is a compilation of the main mountain crags represented through the words of climbers, the eye of photographers such as Colin Threlfall and Dave Cuthbertson (amongst other talented snappers), and the clarifying lenses of poets. Perhaps climbers performing are just physical poets, at least when they get the moves right! see: the spoor of the dinosaurs on the Jurassic shore. Some of the photography is the best yet published. Dave Cuthbertson's shot of Dave MacLeod on Dalriada on The Cobbler, in MacLeods's 'apprenticeship' piece on the venue, with the black sea of nothingness behind him as he crimps up a bottomless wall, ropes telegraphing commitment beneath him, is beautiful to behold in print. Colin Threlfall's broad panoramas of the Cuillin, and crag shots such as the remote winter cliffs of Mainreachan Buttress, as well as his frontispiece spreads for the sections, are some of the best landscape photographs out there. The individual 'action' shots from belay partners are remarkably good and often unposed, due to the nifty digital cameras available today: Tony Stone on Sron Ulladale's The Scoop is at once both inviting and terrifying. Possibly my only criticism would be that there were no female writers in the collection, despite a number having contributed to Scottish climbing over the years (Cynthia Grindley, Jo George etc.). The ratio of male to female is certainly not to zero. Perhaps in future the gender imbalance on the extreme routes will not be so obvious as climbing abilities between the sexes narrow, due to the opportunity to train and the precedence of a few notably talented and active female traditional climbers raising the expectations, such as Tess Fryer. 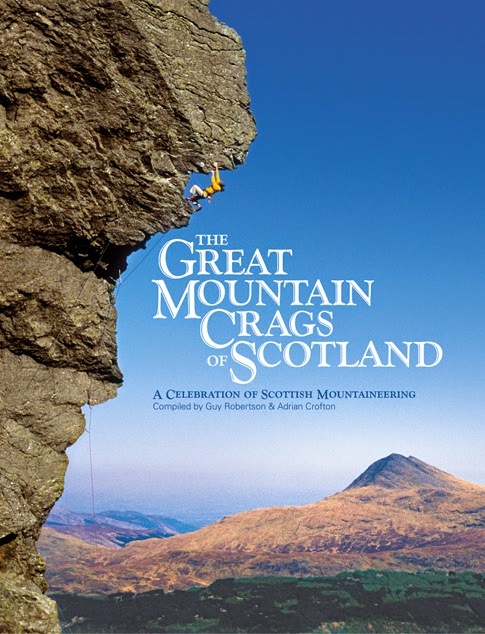 The selection of crags and venues in the book is well balanced between rock and winter, and of course it is a selection, as many major cliffs remain almost devoid of routes for their size, such as the mighty Sgurr on Eigg, though it has a few modern classic extremes and seemed a glaring omission from this collection. 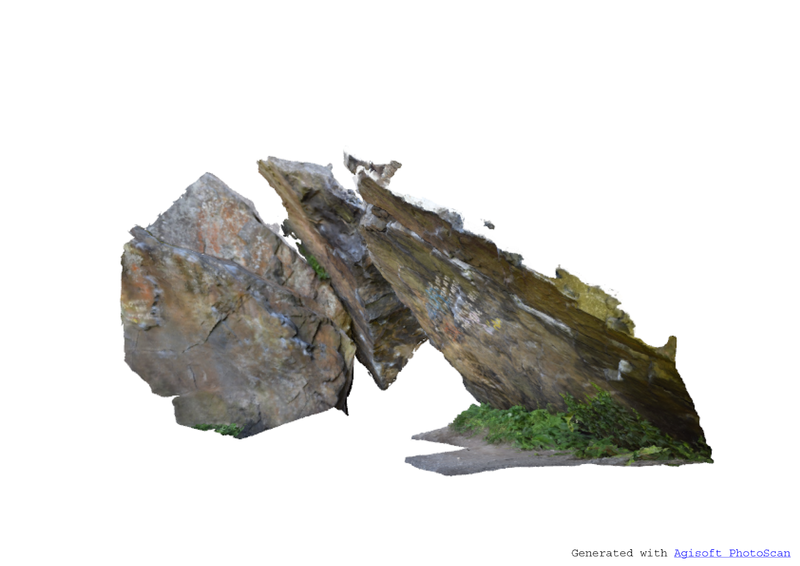 Then again, there are plenty of large crags that didn't 'make it' and Scotland is a massively folded, 3D landscape with many hidden and remote crags, so this is hardly a criticism, and the book is really meant to be inspirational rather than completist. It couldn't be, considering the territory and the history of climbing we have. 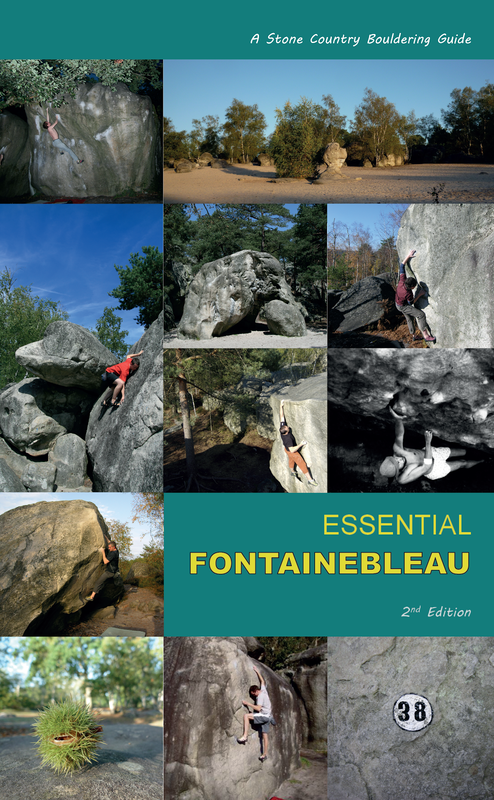 This is an essential book to own if you are a climber. It is truly inspirational. And the thing about this book is its dual end-product: its archival worth and its visual and literary inspiration. As an archive, it is a document of a community's soul, each climber's experiences adding to the spirit of the Scottish mountains, despite it all being necessarily personal and individual at the crux moments! And inspiration, because a book like this shows that the climbers in this book are channeling something much bigger than themselves - an energy of challenge and adventure which will send an electric charge through every reader, youthful and experienced alike. First of all, having a couple of 'refreshing pints' in the Strontian Inn was a bad idea . . . the hottest day of the year at the fag-end of July, the tarmac bubbling, it seemed wise at the time. 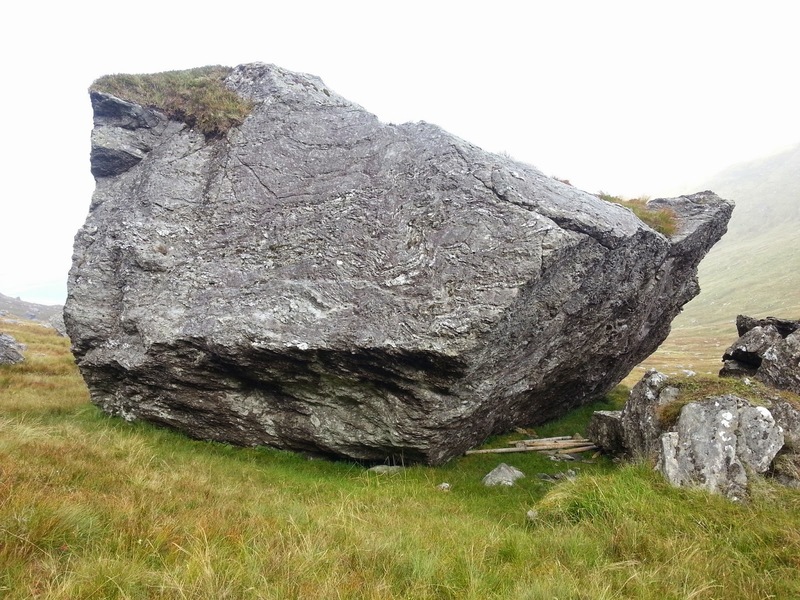 The Bealach Feith Nan Laogh could wait a bit. I checked the specs of the climb, which seemed less electrically-shocking at a pub picnic table in the sun: 2.6 km with an average gradient of 11.8% . . . steep, but no killer, I reasoned. Something at the back of my head crawled and writhed, trying to fathom what higher gradient would average it to 11.8! I clipped into the bike and set off, my mind a fuzzy blank of summer bliss. 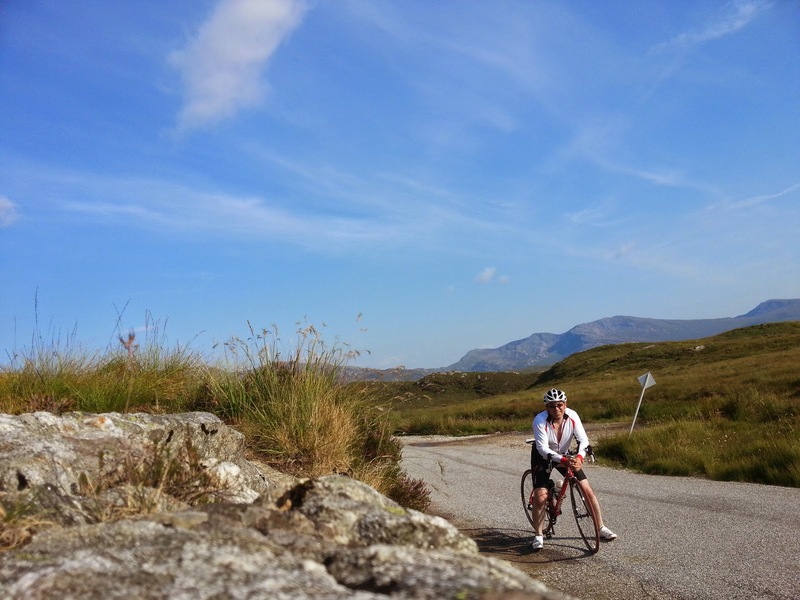 Turning north off the main road at Strontian towards innocuous-looking hills, the wooded first few kilometres are flat and surfaced with new rolling tarmac, I was in a pleasant dream of cycling paradise, spinning without a chain, listening to birdsong, still on the big ring. 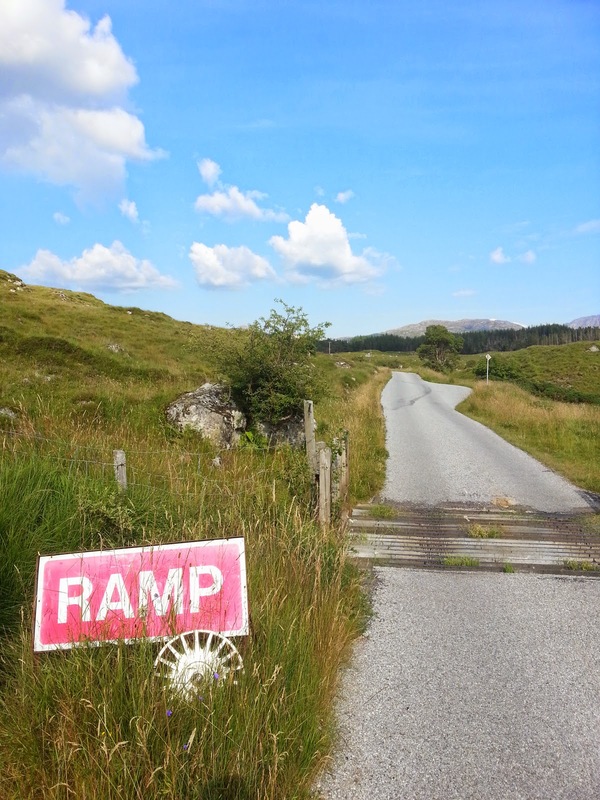 A small sign turned me left up a short wooded hill towards 'Pollochro 8m'. Not far really . . . 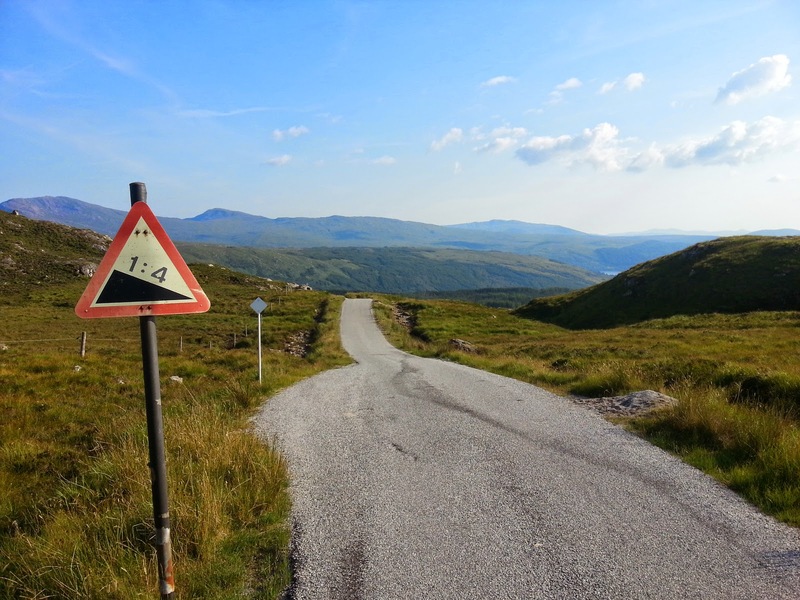 I knew the climb began shortly but the small ramps weren't difficult and I was still outstripping the chasing horse-flies until a sign above a lost hub-cap said 'RAMP' in big capitals on a red background. The road didn't seem that steep, I was still spinning off the beers, marveling at the rock-garden scenery. Things focused down to the width of my front tyre as I got out of the saddle at Belgrove House and dropped to the wee ring to turn some sharp corners through the old pines. No biggie. Then the vista suddenly opened up and I looked uphill to a shocking sight. The strip of gravelly tarmac took off up a hill that seemed to be a painted grey vertical line on a green background, a Rothko painting on its side. Half way up the hill, a camper van and two chairs sat perched precariously on a rocky ledge of a layby, looking out over Loch Sunart and the punishing evening sun. I endured a mild gut panic, there was an audience, and the beer was making me feel suddenly queazy rather than refreshed. Oh well, down to the second-last gear, out of the saddle. I passed the run-off for the old lead mines, clunking up to the big ring's last-chance-saloon, grinding at just above fall-off pace, trying not to go into the red. Jeez, this was steep. Just 50m or so to the camper-van, then I'd be okay, it flattened there, I said to myself. The people in the deck-chairs watched me like an old curious tractor from the 60s, going to an agricultural fair. Not far off. I passed them and gasped a greeting, more like a plea for help. The horse-flies had found me, mocking my pace, so I spun a bit and went into the red, rounding a corner to a sudden and sickening rise in gradient to a hairpin. Jeez, that must be 25% I thought! I ground up it, heart racing to the max, sweat washing my eyes with battery acid. I rounded the corner and another rise of the same punched me in the gut and I unclipped, steeping a foot to the ground just to catch my breath. Hell! 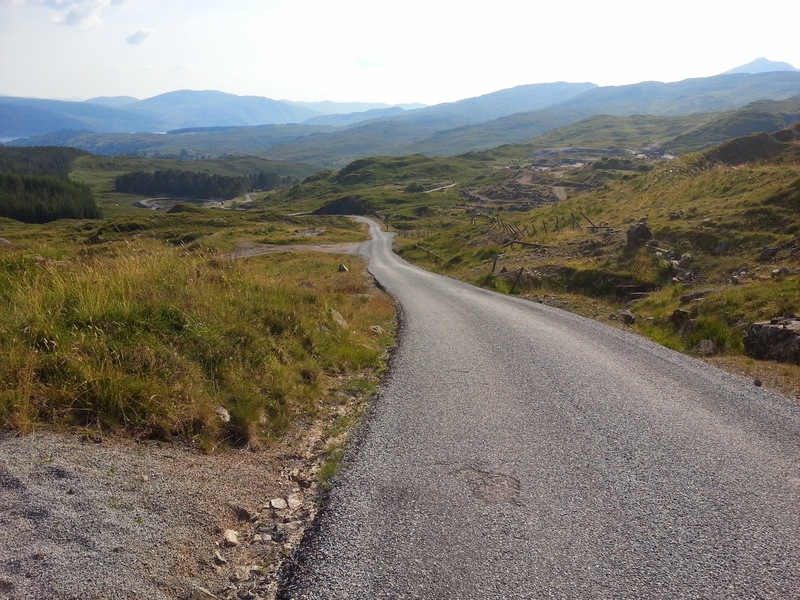 I wheezed for a minute, eyes full of tarmac, then turned and rolled down to a layby, reclipping, turned again tightly and ran at the beast this time, grinding out the switchbacks and trying not to spin in the melted tarmac and gravel. 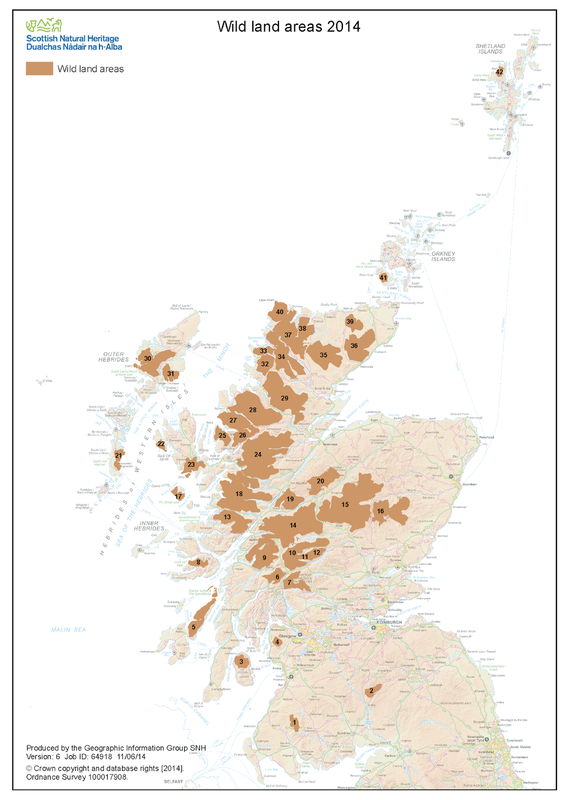 If I didn't dig a little deeper, I would end up a tarred and Ruskolined mess on the Bealach Feith nan Laogh. 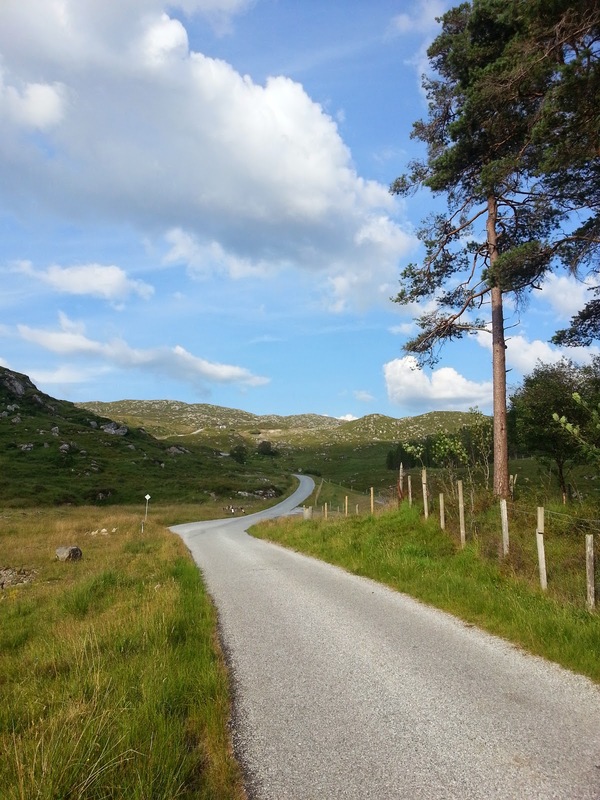 The road finally straightened a little but continued to rise at a punishing gradient, bellying up through the rocks and whispering grass towards what looked like a mobile mast - perhaps the pass, a sign of the end to this punishment? It ended thus, hung over the handlebars beside an old gas storage tank, it was full, I was empty. I've never burned off two beers quite as quickly in my life.